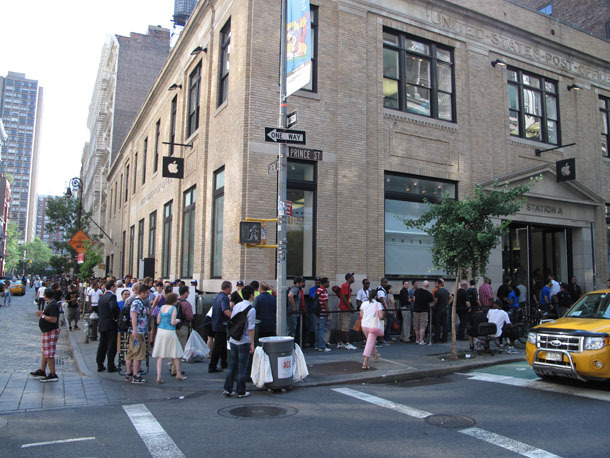 Last night, the line stretched around the corner outside the Apple store in on Prince Street in New York City. This morning around 8:30, it stretched all the way around a full city block as more people lined up before work to purchase an iPhone 4, which went on sale this morning at 7 am. It appeared that only a few customers were allowed into the Apple store at a time. Compared with the release of the original iPhone, during which Apple store employees threw dance parties and cheered as customers paraded in and out, the atmosphere this time around is much more subdued.